Applications: Ideal for tough grinding on stainless steel and other harder metals using quick change back up pads. 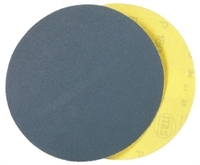 Especially good for orbital sanding of stainless steel where up to 4 times the life can be expected compared to aluminium oxide (brown) discs. Use on orbital sanders or on angle grinders with suitable backing pad. Can also be used on wood, plastics etc. Product Notes: Tough zirconium oxide abrasive grit to give high performance finishing. Available in a number of popular diameters and hole configurations. If you don't see what you need here, please enquire, as the factory has tooling for a wide range of discs which can be cut to order. Also Available: We stock hook backed backing pads for grip discs.